The E-Type sports car. In 1962, Jaguar cars considered the idea of building a low drag racer, based on the D-Type, which had been discontinued five years before. The concept was tested by designing a fixed head coupe, with a monocoque structure, which would be rigid enough to withstand the stresses of racing. Lightweight aluminium body panels would be used, whilst the front sub-frame supporting the engine and front suspension would be made of steel. The incline of the windscreen was increased, and cooling vents for the rear brakes were added near the rear windows. Apart from the windscreen, perspex replaced the use of glass elsewhere. It was powered by a tuned version of the 3.8 litre XK engine as used in the later versions of the D-type Jaguar. Only one prototype was built, and although it produced improved performance over the production E-Type, the increase was not sufficient to warrant development, and the project was shelved. 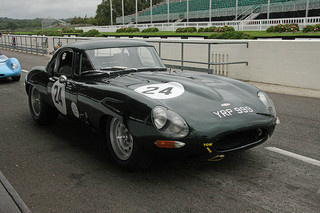 In 1956, Jaguar made the decision to exit car racing. 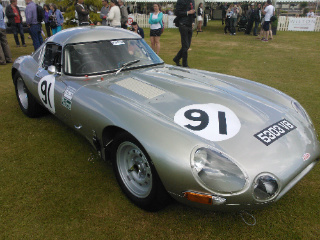 However, when the E-Type was launched in March 1961, it was at a time of growing interest in GT cars. Compared with purpose-built race cars like the Ferrari 250 GTO, the E-Type was completely outmatched. What was needed was to create a lighter version of this road car. 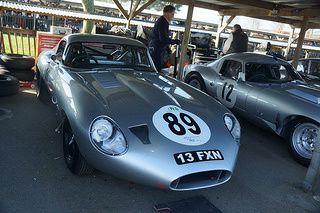 Consequently, the company decided to re-enter sports car racing and, in early 1962, instigated a project to develop a lighter version of the E-Type for endurance racing. The result was a decidedly beautiful GT car, which featured a low drag roof and rear section. It first ran in May 1962, but was sidelined since the FIA would not include the GT Class in the Sports Car World Championship. However, a private motor dealer prepared a convertible which became Jaguar cars principal development E-Type, and was progressively modified with a lighter gauge steel body, and an engine with a wide angle head. 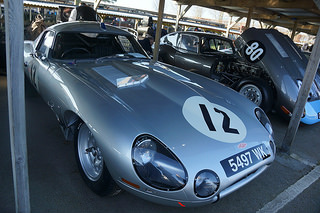 The result was the Lightweight E-Type Jaguar sports car and, in October 1962, work began on producing the first car which was intended to be the prototype for a short run of similar cars. In the end, 12 factory Lightweights were built, with all but one being delivered in 1963, along with two semi-lightweight versions. In many ways, the Lightweight E-Type was the natural evolution of the Low Drag Racer. With the Lightweight now 600 pounds lighter, and developing 340 bhp, it was now ready to take on the Ferrari 250 GTO's. However, for improved reliability, the basic D-Type cast iron engine with a Moss gearbox replaced the original units. Two of the 12 Lightweights were converted into the low drag racer, with one of them taking fifth place in the 1962 Le Mans race. A production E-Type with a D-Type engine took fourth place in the 1962 Le Mans, which was the best ever result for an E-Type. It was the efforts of numerous privateers, particularly in the US, that kept the Jaguar cars name alive. In hindsight, had Jaguar produced a competition version of the E-Type in 1962, and provided suitable backup, the Ferrari GTO would probably not have dominated the International GT Class in the way that it did. 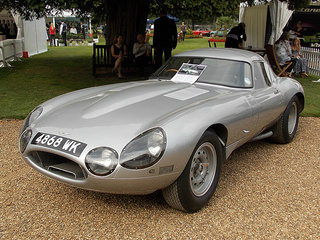 In all, Jaguar made 18 of these aluminium bodies, of which 12 were used for the cars produced in 1963, with another four being used for repairs, and the remaining two being sold privately. 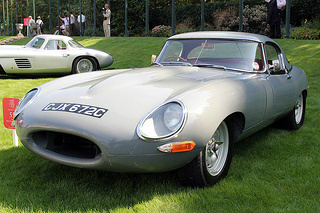 The E-Type Jaguar was highly successful in SCCA (Sports Car Club of America) production sports car racing, with a Series 3 V12 racer taking the B-Production Championship in 1975. Originally, 18 Lightweights were scheduled to be built but, in the end, only 12 were produced. Consequently, in May 2014, Jaguar's Heritage Business indicated that it was to hand build the six remaining Lightweights to the exact specifications of the originals. 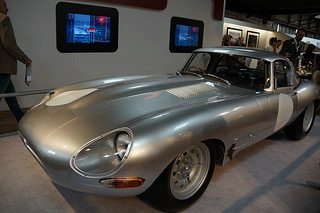 In terms of sales of these Jaguar cars, in 2005, a beautiful example of an authentic 1963 Lightweight E-Type, which had been owned and driven by the racing driver Peter Sutcliffe, was put up for auction in the UK, with a guide price of between £1 million and £1.2 million. Amongst the numerous Jaguar cars, this model will always stand out. A 1963-64 Jaguar E-Type Lightweight Racer, in superb condition and with a pedigree, would command in the region of £300,000/$480,000.